For other places with the same name, see Chmielnik (disambiguation). 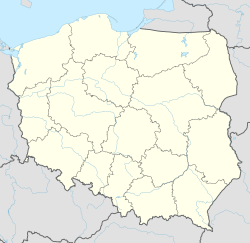 Chmielnik [ˈxmʲɛlɲik] is a town in Kielce County, Świętokrzyskie Voivodeship, Poland. It has a population of 4,005 (2006), and lies in historic Lesser Poland. The name of the town is derived from hop (Polish: chmiel). Chmielnik is home to a sports club Zenit, established in 1946. Chmielnik was first mentioned in connection with the Battle of Chmielnik with Mongols and Tatars fought in the area in 1241 (see Mongol invasion of Poland). The Mongols and the Tatars were opposed near the settlement by Polish knights from the provinces of Sandomierz and Kraków. In the town there is a monument dedicated to this battle. At the beginning the settlement was a property of the dukes of Sandomierz, but in the 13th century it became owned by the Odrowąż family. The oldest monument in the town is the Church of Holy Trinity together with a church graveyard from around 1356. Later on Chmielnik belonged to the Oleśnicki family who made efforts to grant it town charter. In 1541 Chmielnik was granted Magdeburg rights by king Zygmunt II August, hereby formally becoming a town. In 1580 king Stefan Batory granted the town a privilege of organizing more fairs. At the beginning of the 17th century the ownership of the town was transferred to the Gołuchowski family. In the 16th and 17th centuries the town was a major centre of Polish Protestants (Calvinists and the Polish Brethren). On the basis of privilege granted by Krzysztof Gołuchowski in the second part of the 17th century the town was populated by Sephardi Jews expelled from Spain. They built a synagogue in 1638  and took over houses and shops of the Polish Brethren expelled from the town in 1658. In 1787 Chmielnik became a property of the Chłapowski family. After the Partitions of Poland the town was taken by the Habsburg Empire (1795). In the years 1809–1815 it was in the Duchy of Warsaw, later in the Russian-controlled Congress Poland (1815 - 1915). In 1829 Dezydery, the last of the Chłapowski family, sold the town to Kazimierz Tański. It was in the hands of this family until 1945. Before the Second World War, over 80% of the 12,000 inhabitants were Jews. After capturing the town in 1939 the Germans slowly discriminated against the Polish and Jewish population, which swelled during the war as Jews fled from other towns arrived at Chmielnik. Over several months Germans transported Jews to concentration camps, mainly Treblinka, where they were exterminated. Just after the war, only four Jewish residents residing in the town had survived. The remaining Holocaust survivors emigrated, mostly to Israel, Canada and the United States. There is renewed interest in Chmielnik's Jewish heritage although no Jew has lived there for decades.. The synagogue has been renovated and transformed into a museum to the memory of the Jews of the region. This page was last edited on 18 March 2018, at 08:53 (UTC).